*Data rates may apply. Reply stop to 41400 to opt-out. Up to 5 messages per month. Now 14 oz! They're Even Bigger Than Before! It's happy hour! Are you getting hungry? A blend of jalapeño cheese, onion, tomatoes and spinach. Served with warm corn tortilla chips. avocados, cilantro, serrano peppers, onion, spices, queso fresco, lime juice and pico de gallo. Served with warm tortilla chips. Eight crispy flour tortillas stuffed with shredded beef. Served with jalapeño cream cheese. Layered with grilled chicken, refried beans, jalapeño cream cheese and cheeses, then baked. Garnished with jalapeños, pico de gallo, sour cream and guacamole. Grilled parmesan crusted tortilla with grilled shrimp, sliced avocado and cheeses. Served with sour cream, guacamole & pico de gallo. Fresh spinach, flame-grilled chicken and bacon. Served with sour cream, guacamole, and pico de gallo. Served with sour cream, guacamole & pico de gallo. Fresh grilled vegetables. Served with sour cream, guacamole & pico de gallo. ~ Our Pride and Joy ~ Crispy chicken burrito topped with jalapeño cream cheese and Colby Jack cheese, then baked. Served with Mexican rice and refried beans. grilled chicken breast finished with jalapeño tequila-lime butter. Topped with pico de gallo, queso fresco, chile crema, tortilla strips and cilantro. Served with cilantro rice and charro beans. Two house made carnitas tamales baked with New Mexico red chile sauce and finished with chile con queso. Served with mexican rice and refried beans. Grilled mahi served atop black beans, cilantro rice, and cabbage. Topped with choptle crema, roasted corn, pico de gallo, sour cream, guacamole, cilantro and queso fresco. Four crispy corn tortillas filled with chipotle seasoned chicken and topped with guacamole, pico de gallo and cheese. Served with Mexican rice and refried beans. stuffed with sautéed peppers, onions and cheese. Baked with New Mexico red and roasted green chile sauces, and cheese. Garnished with pico de gallo and roasted corn. Served with cilantro rice and black beans. Three jumbo bacon-wrapped shrimp stuffed with jalapeño and cheese, presented on a sizzling skillet with grilled chicken and skirt steak. Served with cilantro rice, black beans, mantequilla butter and warm flour tortillas. Grilled chicken served atop a bed of caramelized onion and bell peppers. Garnished with pico de gallo, guacamole, sour cream, shredded cheese and a grilled jalapeño. Served with Mexican rice, charro beans, and warm flour tortillas. Nine jumbo shrimp served atop a bed of caramelized onion and bell peppers. Garnished with pico de gallo, guacamole, sour cream, shredded cheese and a grilled jalapeño. Served with cilantro rice, black beans, mantequilla butter, and warm flour tortillas. Grilled vegetables served atop a bed of caramelized onion and bell peppers. Garnished with pico de gallo, guacamole, sour cream, shredded cheese and a grilled jalapeño. Served with Cilantro rice, black beans, and warm flour tortillas. Grilled skirt steak served atop a bed of caramelized onion and bell peppers. Garnished with pico de gallo, guacamole, sour cream, shredded cheese and a grilled jalapeño. Served with Mexican rice, charro beans, and warm flour tortillas. Our Classic 14 oz. Premium Margarita served Frozen or On The Rocks. Super premium Jose Pepper's Blanco Tequila, Patron Citronge, Brandy and our signature Margarita Mix. 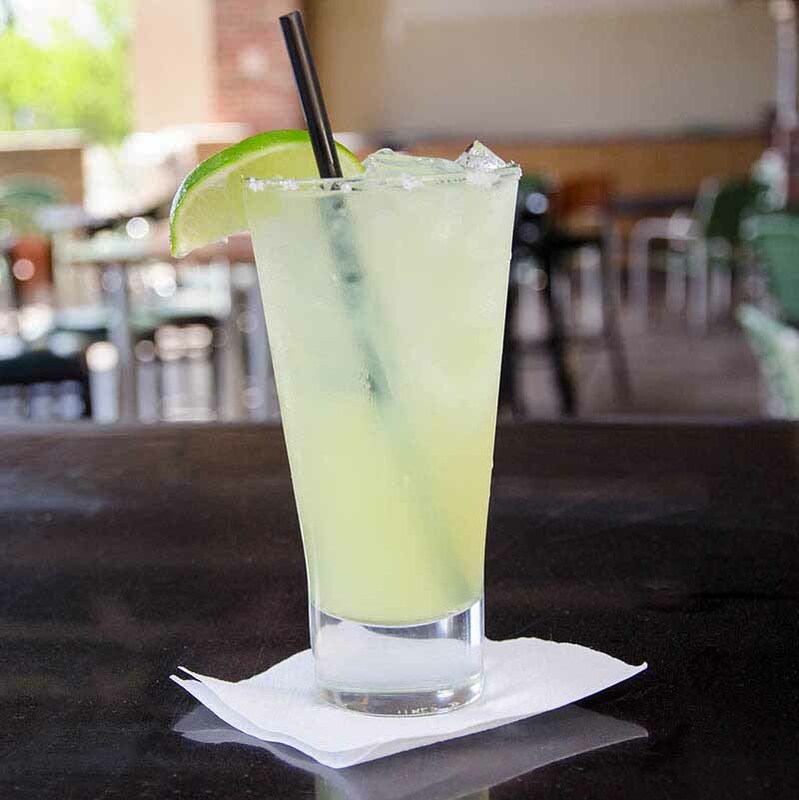 Refining And Evolving The Margarita Since 1988. Made with our Jose Pepper's 30th Anniversary Reposado Tequila, Grand Marnier, agave nectar, and our signature Margarita Mix. Low Carbs. Less Sugar. Less Calories... Made with our Premium Jose Pepper's Blanco Tequila. Two seasoned chicken enchiladas baked with jalapeño cream sauce. Topped with guacamole and pico de gallo. Served with cilantro rice and refried beans. Two flour tortillas filled with skirt steak, portobello mushrooms, jalapeño cream cheese and cheeses. Baked with chipotle cream sauce and queso fresco. Served with cilantro rice and refried beans. Two seasoned chicken enchiladas baked with chile verde sauce. Topped with jalapeño cream cheese, sour cream, and guacamole. Served with Mexican rice and refried beans. Two enchiladas baked with New Mexico red chile sauce. Served with Mexican rice and refried beans. One seasoned chicken, one ground beef and one cheese enchilada baked with New Mexico red chile sauce. Served with Mexican rice and refried beans. Two flour tortillas filled with spinach, jalapeño cheese, and onion. Baked with creamy white dill sauce. Served with vegetarian black beans and cilantro rice. Grilled chicken, bacon, cheese and pico de gallo wrapped in a flour tortilla. Baked with New Mexico red chile sauce and jalapeño cream sauce. Topped with sliced avocado. prepared to order with our fresh ingredients - cilantro rice, black beans, shredded lettuce, cheese, Mexican corn, pico de gallo, sour cream, and guacamole. Served with a side of tomatillo dressing. Seasoned chicken, portobello mushrooms & cheese wrapped in a flour tortilla. Baked with chipotle cream sauce. Served with Mexican rice and refried beans. Prepared San Diego style with cabbage, chipotle crema, queso fresco and avocado in two flour tortillas. Served with cilantro rice and black beans. Two Soft flour tortillas filled with your choice of meat. Topped with lettuce, tomatoes and cheese. Served with Mexican rice and refried beans. Sauteéd shrimp, bell peppers and pico de gallo deglazed with tequila in two flour tortillas. Topped with cheese and cilantro. Served with cilantro rice and black beans. Cerveza battered Shrimp served San Diego Style with cabbage, chipotle creama, queso fresco, & avocado slices in a flour tortilla. Served with cilantro rice & black beans. Two crispy corn tortillas filled with your choice of meat. Topped with lettuce, tomatoes and cheese. Served with Mexican rice and refried beans. 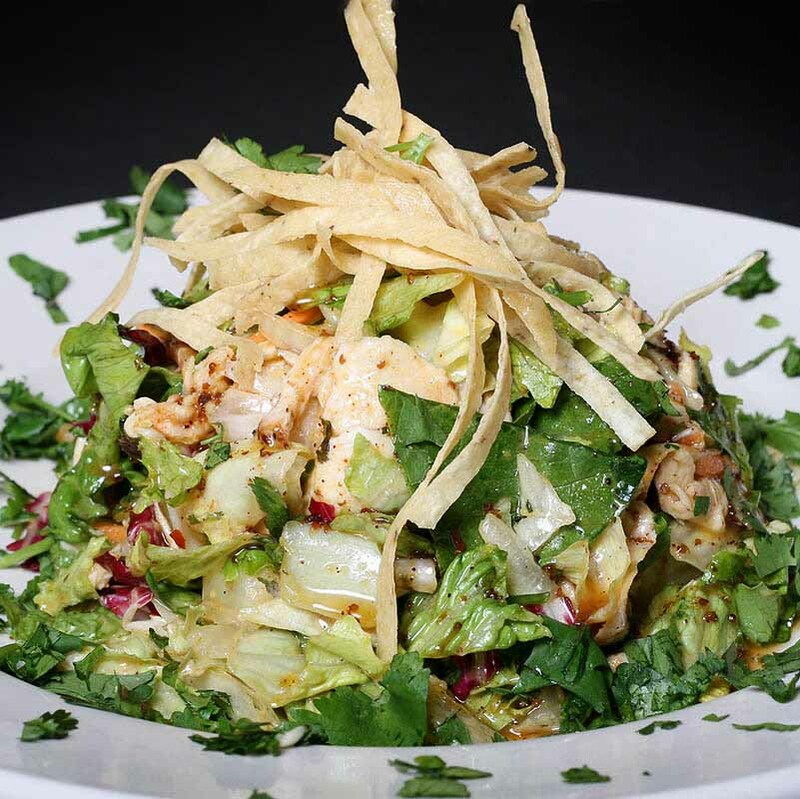 Thin sliced chicken, fresh greens, tortilla strips, and cilantro tossed in honey-lime vinaigrette. Finished with ancho-honey mustard. Southwest tortilla broth with roasted tomatillos, chicken, pico de gallo, queso fresco, corn, avocado, Mexican crema, and tortilla strips. Served with a mini cheese quesadilla. grilled chicken, black beans, cilantro rice, fresh greens topped with queso fresco, pico de gallo, and roasted corn. Served in a crispy cheese tortilla bowl with tomatillo ranch. thin sliced chicken, fresh greens, avocado, cheese, bacon, tomato, and egg. Tossed in buttermilk ranch dressing. Seasoned shredded chicken in a crispy flour tortilla, topped with New Mexico red chile sauce and sour cream. Served with Mexican rice & refried beans. Your choice of ground beef or shredded beef in a crispy flour tortilla topped with chile verde sauce & sour cream. Served with Mexican rice & refried beans. Ground beef, refried beans, jalapeno cream cheese & crispy tortilla strips in a crispy flour tortilla. 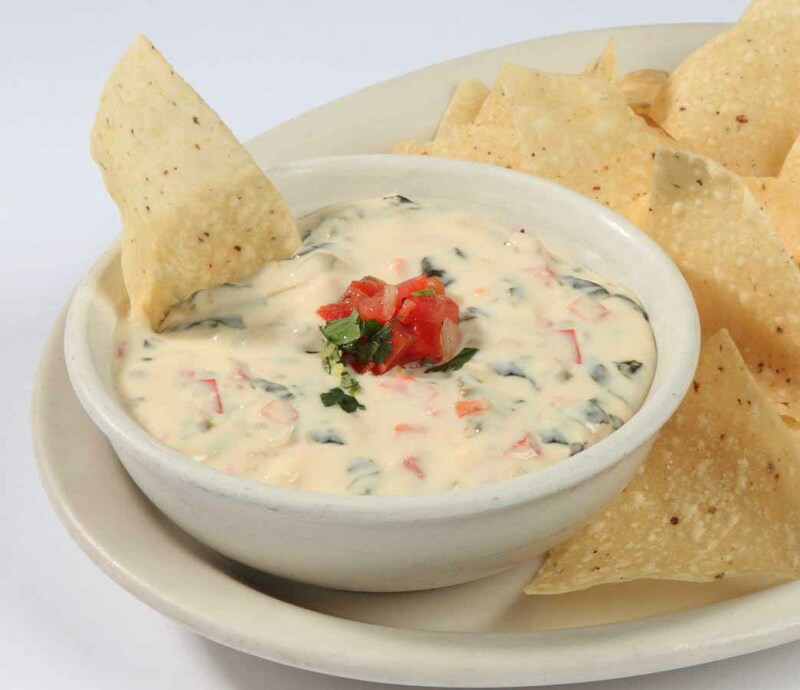 Topped with chile con queso, jalapenos, & sour cream, Served with cilantro rice and refried beans. Chicken avocado enchilada, crispy chicken taco & a bean tostada. Served with cilantro rice and refried beans. Carnitas tamale and cheese enchilada baked with our New Mexico red chile sauce and finished with chile con queso. Served with a crispy shredded beef taco, Mexican rice and refried beans. hand-pattied burger, with or without American cheese. Served on a sweet mesquite sourdough bun with lettuce, tomato, onion, pickle, a side of chipotle mayo and crispy fries. grilled chicken, bacon & Swiss cheese served on a sweet mesquite sourdough bun with lettuce, tomato, onion, pickle, a side of chipotle mayo and crispy fries. Vanilla bean ice cream rolled in a crunchy coating of crushed flakes, cinnamon and sugar. Topped with honey, strawberries and whipped cream. Served in a crispy shell. Vanilla bean ice cream rolled in Oreo cookies. 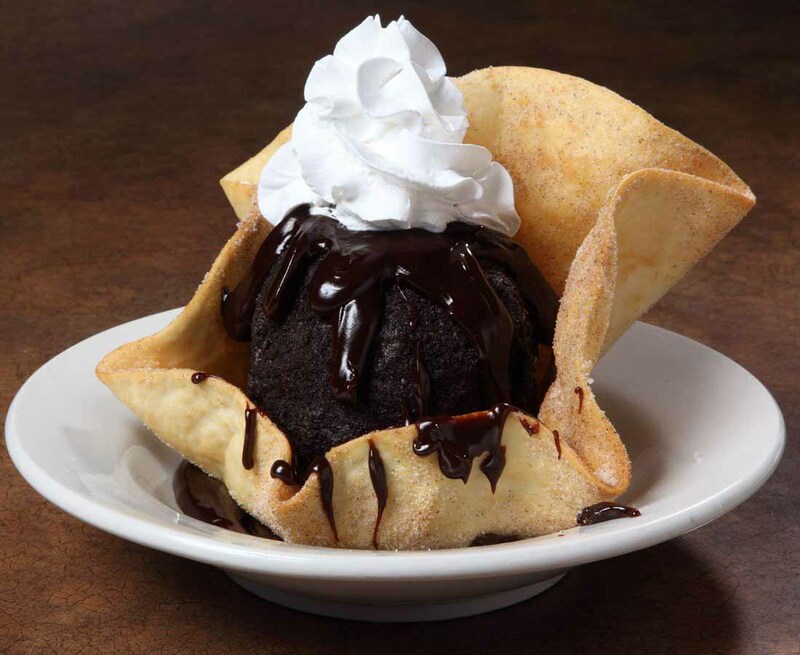 Topped with hot fudge and whipped cream. Served in a crispy shell. Fried Mexican pastry sprinkled with cinnamon and sugar. Served with honey. skirt steak sautéed with onions, poblano peppers and bacon in a flour tortilla. Topped with cheese, avocado and cilantro. Served with a cup of charro beans and Mexican rice. Sauteéd shrimp, bell peppers and pico de gallo deglazed with tequila in a flour tortilla. Topped with cheese and cilantro. Served with cilantro rice and black beans.